This fabulous apartmenth had a huge makeover for 2017. The entire apartment was redecorated in beautiful Egyptian Cotton for a cool Scandi look. The lighting in the lounge has been upgraded to allow a much brighter space when required and all lighting is now LED. The family bathroom has been tiled, floor and walls in a superb Porcelain and there is a new powerful double headed shower, complete with new bath and screen. Added to this a modern vanity basin unit in grey and a new loo! The master ensuite has been reconfigured to allow a spacious 760 x 900 enclosed shower, again with a powerful new double headed shower, sleek wall hung vanity basin in gloss grey, new white towel rad and another new loo! A funky hexagon tiled floor and brick wall tiles complete the new look. Along with various new accessories and soft furnishings this upgrade will ensure Point View is as sought after as ever. 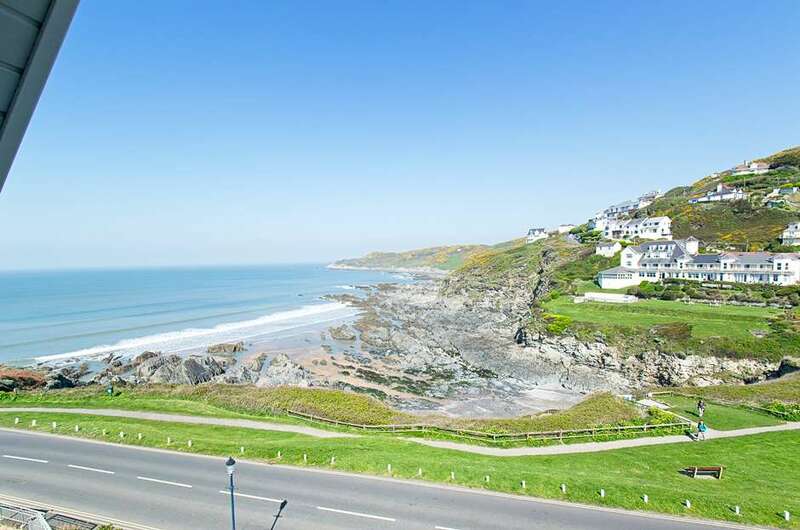 Situated in a wonderful location overlooking the beach, Point View is a 2 bedroom family apartment on Woolacombe's prestigious Esplanade. Directly opposite the nearest surfing beach (Combesgate), a few minute’s walk from Woolacombe main beach and backing directly onto National Trust land, Point View is a popular choice for families, walkers and surfers alike. Inside there are 2 comfortably furnished bedrooms, one with a large king size bed, full ensuite shower room and fabulous view over the beach and sea. The other twin bedded room has a large velux window looking over National Trust land. It is just across the hall from the family bathroom which has a white suite with a newly fitted bath with shower over. The kitchen, dining room and lounge are brought together in one large open plan area making this room a fantastic family space. With a suite of 2 and 3 seater black leather sofas, dining table and chairs to seat 6, TV/DVD, Sky Freeview, coffee tables, bookshelves and French doors onto a small enclosed balcony with full sea view from the dining area and another new superb covered balcony from the living area giving this room a real “Wow” factor, there is everything you would need to relax and enjoy the time away from the beach. There is free Wi-Fi extended from the apartment downstairs. It has been pointed out that this does not always have a good signal so if you rely on having full Wi-Fi all the time then this apartment is not for you. Also there is little or no mobile phone signal here. Music to some peoples ears but was asked by a Trip Advisor review to mention it so I am! In the kitchen are the usual integrated appliances like 50/50 fridge freezer, cooker/hob, full size dishwasher and washing machine. There is a spacious hallway which has a tumble dryer, coat hooks and shoe rack. The entrance is around the back of Crossways Court and up to the 2nd floor via an external open tread metal stairway onto a small decked seating/dining area by the front door. The apartment also benefits from use of the large, shared patio area at the back of Crossways Court which looks onto The National Trust land behind and there is a picnic bench and rotary drier for the use of guests. Travel cot, high chair and secure board storage provided. Dogs charged at £20 per pet per holiday. There are also external steps up from the car parking space. This apartment is over the road from Combesgate Beach, popular for surfing and body boarding at the right tide but there are over 100 steps down. However, just around the corner is the popular Barricane Beach, a delightful sheltered cove with a café in season serving tea and coffee, cakes, ice-creams and lovely food. Main beach is a good 10 mins walk after that. Point View is a great value sea front property in a stunning location, a really popular choice.